OTTOLOCK is a new cinch lock ideal for people who find a U-Lock too clunky to warrant bringing along for a short trip inside a cafe or corner store. 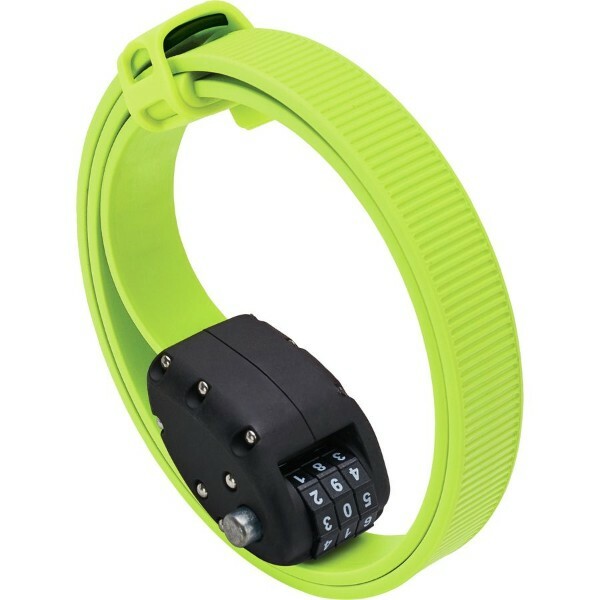 While OTTOLOCKS aren’t a good option for all day use, they are secure enough that we’d recommend them to people looking for protection against theft opportunists. It’s more secure than a cable lock, and much lighter than a U-Lock. They feature a multi-layer steel and kevlar band design, making it challenging to cut and light enough (less than a pound!) to store in a jersey pocket, cargo shorts, or bracketed to your bike — a truly ideal secondary lock that serves a specific purpose that your U-Lock is often over-qualified for. LIGHTWEIGHT: Weighs only 140g – 255g and is easily stowed. So light and portable you won’t even know you are carrying it. COMPACT: Coils to a diameter under 3 inches. Keep it in or around your saddle bag, backpack, in your pocket, or anywhere you want. SECURE: Multi-layer steel and Kevlar® bands (18mm wide) make it very cut-resistant, and stronger than cable locks. RESETTABLE COMBINATION: 3-dial combination lock. You may also reset the combo as needed.